As we passed through this area, we exited through a truly impressive gate. I could tell it was historic, and not a reconstruction, but I had no idea what period it was from. And I certainly didn’t know what its significance was. For our purposes today, I want to focus on that gate as a starting point. It is one of the most exquisite specimens of late Crusader period architecture, and exemplary of the style. Inside the Eastern gatehouse of the Crusader city at Caesarea. Corbels support the vaulted ceiling's ribs. It is, however, due to this taking place so late in the Crusader era that the architecture here is so worth seeing. 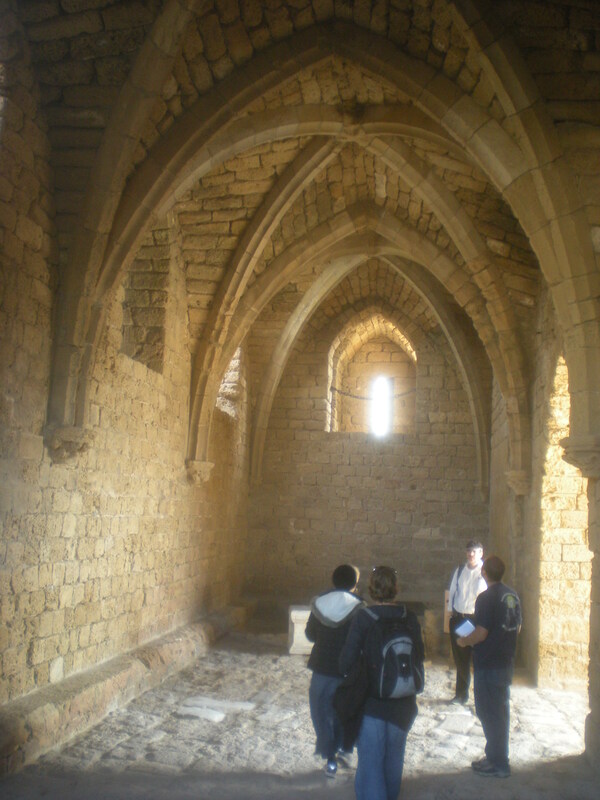 The majority of Crusader-era architecture in Israel is in the Romanesque style. This style is characterized by buildings that are thick and heavy, fortress-like. Even the churches from this era resemble fortresses, reflecting the realities of their times. Put simply, Romanesque architecture lasts. What follows this style in Europe is the Gothic period. As Europe moved out of the Middle Ages towards the Renaissance, Europeans had less to fear. Architecture began to open up, adding height, light, space and grandeur. Characteristic features of the style include the pointed arch (the earliest of which has been found in Israel, by the way), the ribbed vault and flying buttresses and corbels to raise the vaulted ceilings higher in the air. The Crusader gate at Caesarea, architecturally speaking, marks a seam period between the Romanesque and the Gothic. The ribbed vault is evident, and the corbels supporting the ribs add height to the ceiling. At the same time, this gate is far from the height of a typical Gothic building of this sort, and it lacks (logically) the flying buttresses. Thus, the gate is only about 1 1/2 times the height of prior gates. Similarly, the ceiling is made of bricks, rather than wood as it would have been made in Europe. It is for this reason that this gate is one of the few remaining original Crusader gates that we can still stand inside of. Other indications of the shift towards the Gothic can be found in the ornamentation of the gatehouse. The floor is more beautiful than the average and there are stone-carved roses and Fleurs-de-lis (remember that Louis was French) at the bottoms of the corbels. At the same time, however, the gate still provides ample evidence of the city walls’ primary purpose: defenses. In addition to the drawbridge that would stretch across the moat, there is the typical double right angle turn, making it more difficult to storm straight through and into the city. We can see clearly the spot where a gate or portcullis would have been lowered at the threshold, and a deep hole in the side wall into which a cross bar could have been inserted behind the gate. And of course we can look overhead to find where boiling oil could have been poured on the heads of invading enemies should they have gotten across to the gate opening. Caesarea was also an important city during the Byzantine and Crusader periods, and was actually a Bishopry, meaning that we would expect to find a cathedral inside the city. In fact, going to the high point inside the Crusader city reveals some ruins in a similar spot to where a temple to Caesar stood in the Roman era. These ruins are of a small Crusader church that was built on the foundations of a larger Byzantine one. This is fairly standard through the land of Israel. The Crusaders, by and large, had less money than the Byzantines, so most of the churches they built were smaller than the original foundations on which they built. And sometimes, by accident, the places they built their churches on were originally Muslim sites, rather than former Byzantine churches. The first churches were built in the Holy Land by Helena, the mother of Constantine the Great, starting in the year 325. Churches multiplied during the Byzantine era, until the Muslim conquest reached here in the mid-7th Century. There was no major Christian presence here for the next 400+ years, until the Crusaders first arrived in 1099. Thus, many of the sites were difficult for the Crusaders to identify. Thus we also have many misnamed sites due Crusader mistakes (or lack of caring). Caesarea, on the other hand, was very easy to identify and know where it was, due to its unique location. But the small Crusader church vs. large Byzantine church pattern remains in effect here. Furthermore, it seems the Crusader church here was never fully completed. Apparently one of the walls collapsed before they finished. It may also have something to do with the fact that there was still war to contend with, and the Crusaders actually lose control of Caesarea fairly quickly. 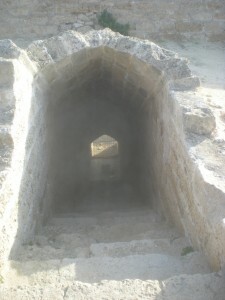 One of the secret postern gates leading to Caesarea's moat. Louis IX’s construction in Caesarea began in 1251. Just 40 years later, the city fell to the Mamluk forces of Baibars. How did this happen with such strong fortifications? And if it happened, why do we still see the walls today? For starters, let’s take a closer look at those fortifications and try to understand them better. The moat around Caesarea is approximately 30 feet deep and over 20 feet across. And like all moats in Israel, it was a dry one. I know most people think of moats full of water and teeming with crocodiles. But the truth is that due to the specific locations of moats in Israel, in relation to the water sources, dry moats were the norm here. In fact, dry moats are at least as effective as water-filled ones, if not more so. In a wet moat, one can theoretically boat across and reach a higher point on the wall. In a dry one, enemies must get down one side, cross the open floor, and then try to scale a smooth and slanted wall. Not so easy. 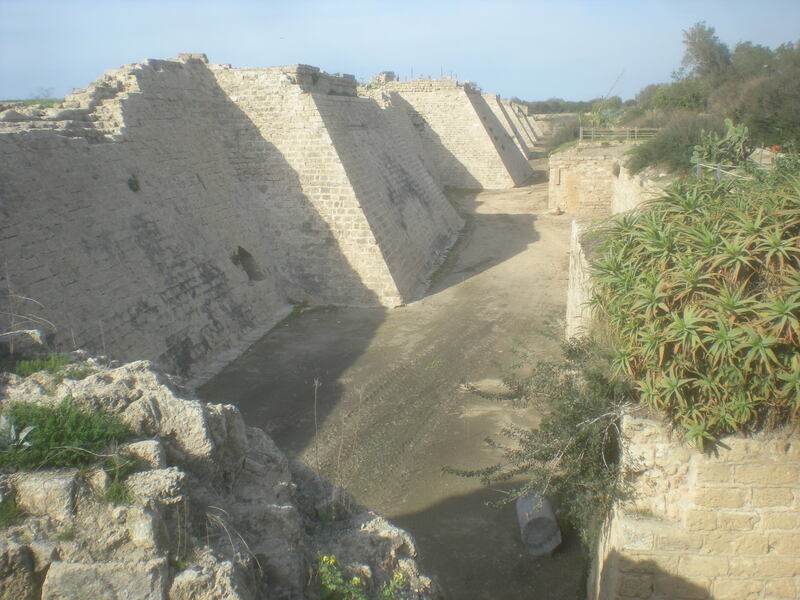 Caesarea’s walls and moat surrounded three sides of the city, with the western side open to the port. This was not a major weakness at the time, however, since none of the Muslim forces before or after the Crusades were naval powers. They were always land-based warriors. One interesting and fun spot we can find in Caesarea is the postern gate. This was a secret passage that connects the inside of the city down to the floor of the moat, exiting in a hidden spot. This allowed people to enter and leave the city without the need to open up the entire main gate to do so. Four such gates were found in Crusader Caesarea. It is possible that the Crusader forces fled through these gates once the Mamluks conquered the city. So with all of that in mind, how did Baibars’ forces conquer the city and why are the walls and fortifications still intact if they did? The walls and towers of Caesarea were in fact too massive and strong for his forces to destroy, so he simply had them climb over the walls in multiple places at once using ropes and (presumably) grappling hooks. Following Baibars’ conquest, the city lay in ruins, uninhabited until the 19th century. The Mamluks systematically destroyed all of the Crusader port cities since, as noted earlier, they were not a seafaring people. Thus they had no need for such ports. Still a look at the artificial harbor of Caesarea that we can see now is a nice summary of the Crusader architecture to be found here. We can see remains of the artificial breakwater that created a harbor for ships. But if the Crusaders had less money than the Byzantines, they had even less than the early Romans, such as Herod who originally built Caesarea. As impressive as the Crusader harbor is today, it is just 1/10 the size of the original Herodian one. Crusader architecture is interesting, and the specific architecture here is intriguing for its transitional aspects. But connecting it and placing it in the context of the history of the land of Israel from earlier periods is another lovely aspect of a visit to Crusader Caesarea.